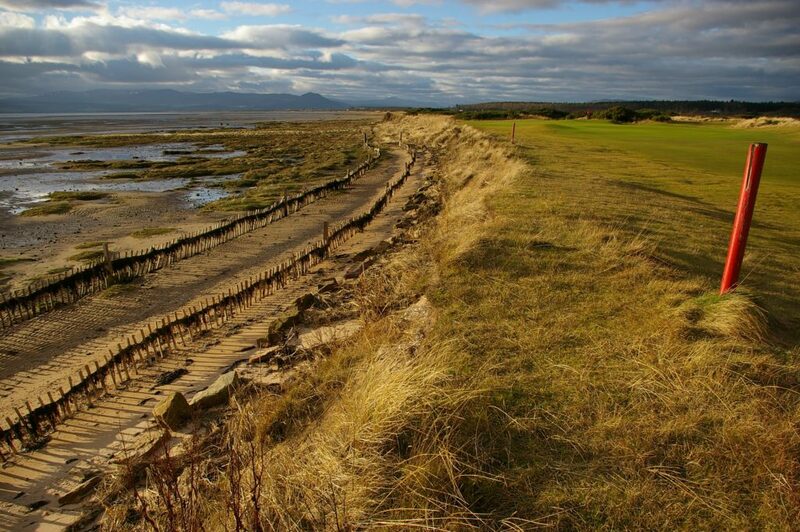 A number of gaps in the saltmarsh habitat in the Dornoch Firth means part of Royal Dornoch’s Struie Course is vulnerable to flooding and even being lost to the power of the waves. However, a project starting next month will transplant hundreds of greenhouse-grown native saltmarsh plants to help restore the natural defences. Saltmarshes provide important habitat for a wide range of wildlife and protect coastal land from flooding and erosion. However, shoreline degradation and climate change are increasingly placing these grassland areas under threat. Dr Clare Maynard, a research scientist at St Andrews University and Chair of the Marine Alliance for Science and Technology (MASTS) Coastal Forum, is the project manager of Green Shores, a £155,000 scheme promoting the restoration of saltmarshes that has grown to include the Tay and the Dornoch Firths. Royal Dornoch Golf Club is providing £10,000 a year for three years towards the project to help safeguard the 10th fairway on its Struie Course, which has been under attack from the sea. The club, along with Scottish Natural Heritage, the Scottish Environment Protection Agency, the St Andrews Links Trust, the Ministry of Defence, Fife Council, the Scottish Rural Development Programme’s LEADER, MASTS and local community volunteers also support the project. Dornoch Academy pupils will help greenkeepers, researchers and community volunteers with the transplant effort and will grow saltmarsh plants in school greenhouses for planting next year. She said gaps of tens of metres in the saltmarsh habitat close to the Struie Course are causing concern: “Coastal erosion is at its worst at the gap in the protective saltmarsh. There are flooding issues in the winter as well as year-round energy from waves degrading the edge of the course. She said a spadeful of healthy saltmarsh plants will provide at least 100 transplants. These will be cultivated and then taken to the Dornoch Firth. Individual plugs, around 5cm in diameter, will be planted into the sand, supported by bio-rolls filled with coir, a natural and sustainable waste product from the husk of coconut shells, to act as wave breaks. The plants will spread out as they grow, filling in the gaps and joining the natural saltmarshes. The plants also trap sediments, raising the surface elevation, which allows the marsh to keep pace with sea level rise. The project will be repeated next year, using plants grown in the school greenhouse, and possibly 2020 if funding allows. Dr Maynard added: “We will fill in the gaps with saltmarsh transplants to provide a soft engineering solution to this problem in a way that is good for everyone as it helps the environment and there is no need for an expensive sea wall. “It’s a long-term process, not a quick fix, and while we cannot stop the sea, we can buy time for the golf course simply by having more naturally robust habitats in front of the course. 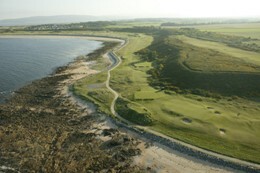 Neil Hampton, Royal Dornoch’s General Manager, said: “in 2010 we noticed a gap appearing in the saltmarsh affecting the 10th hole. If nothing was done we could have lost the whole fairway. “We tried a number of methods to break the power of the waves, but when we learned of Dr Maynard’s work we decided it was the best way to tackle this potentially serious issue. Dr Alistair Rennie, SNH Geodiversity Manager and Project Manager for Dynamic Coast, Scotland’s National Coastal Change Assessment, said: “Climate change is already affecting our shores. Scotland’s soft coast has seen an increase in the extent and rate of erosion since the 1970s.